A nice cup of tea is the usual answer in Britain and Ireland to any everyday problem. Nothing is so bad that a nice cup of tea with a friend or family member can't make it better. Pour freshly drawn water (see note below) into a tea kettle. Electric kettles are fast and convenient. If infusing a pot of tea, pour some hot tap water into your teapot and let stand for about several seconds to a minute to pre-warm it. Alternately, you can swish some of the hotter boiling water from your kettle around in the teapot for a few seconds. Pour out this water before adding the tea to the teapot. If you are using an infuser, be sure it is closed tightly so the tea does not spill into the pot. Rinse the tea-filled infuser briefly under cool tap water to wash away tiny flakes that would otherwise drift into the teapot. If using a filter basket infuser, do not overfill the basket (refer to the instructions that came with your basket). The brief rinse is usually not necessary unless the basket's mesh is quite porous. Simply dropping loose tea into the teapot is also an option, though you may want to strain the tea as you pour it into the cups. Place the tea or tea bag into the teapot. When the water reaches the preferred temperature (see note below), pour it from the tea kettle into the teapot or single-serving teacup. As you pour, try to avoid pouring directly onto the tea (especially important for green and white teas) to avoid scalding the leaves. Allow the tea to infuse quietly (i.e., do not stir the teapot or "dunk the teabag"). Agitating the tea releases more of the bitter compounds and degrades the taste. Watch the time to avoid over-infusion (see note below), and remove the infuser or tea bag when the time is up. If you did not use an infuser or tea bag, pour the tea into cups for immediate consumption. Remember that the tannins in tea stain, so it is advisable to pour the tea over a non-staining surface, wipe up any spills quickly, and do not leave tea standing in a teapot for long periods of time. Generally, green and white teas need no sweetener or milk added to them for a delicious taste if prepared properly. Some research indicates that adding lemon to green tea may make some of the healthful compounds in the tea more easily available to the body, and it provides a different, fresh taste to the tea. Lemon pairs well with citrus-flavored teas, such as the bergamot-enhanced "Grey" teas (e.g., Earl Grey, Lady Grey, etc. 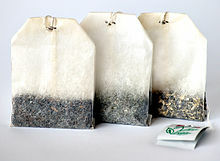 ), and unflavored black teas. Milk pairs well with sweet, flowery, or "fruity" teas, or with any black tea in which you wish to reduce bitterness. Never combine milk and lemon in the same cup of tea or the milk will curdle into lumps. Always add sweeteners to tea before adding any milk; otherwise, the milk will cool the tea, and the sweetener will not dissolve properly. For better dissolving, it is preferable to add several small amounts of sweetener to the tea, stirring each time, rather than adding a large amount of sweetener at once. Chai teas by definition require the addition of milk, ranging from one-fourth to one-half of the total volume, and a sweetener. The milk may be warmed if serving hot chai. Otherwise, cold milk and ice cubes make a lovely iced chai. For the freshest tasting cup of tea, you should always use mineral water or freshly drawn water direct from the tap that has been running for a while. Standing water loses oxygen, and the resulting tea tastes flat. If your tap water is chlorinated, a compromise can be reached by drawing fresh water and letting it stand uncovered for a couple of hours to allow the chlorine taste to leave the water; although, using mineral water is a quick and easy solution. Boiling the water for long periods also removes oxygen from the water, so always use fresh water (do not re-boil it), and use the water quickly after it comes to a boil. White tea and Yellow tea are the most delicate of all teas and require a water temperature of 60-65°C need an infusion time of 2 minutes. Using too high a tea or steeping for too long has a tendency to mask some of the delicate nuances of the tea and leave it a bit bitter. Green tea requires water that is (65-75°C). You may either pour the hot water from the tea kettle into the teapot prior to the boil, or allow the water to come to a full boil (the better choice if water quality is questionable) and then allow the water to cool again prior to pouring over the tea leaves. Green teas usually infuse anywhere from :30 seconds to 2 minutes. Bitterness in the tea is usually the result of overheating the water, infusing the tea for too long, or both. Oolong teas are 20-80% oxidized, thus their preparation method usually falls somewhere in between green and black teas. The water should just be below a boil, 75-80°C), and the infusion time is typically 2-3 minutes. Black tea (aka. Red tea, having been oxidized and more stable, infuses best with water that is 80-90°C. Infusion times are generally longer, with 3-5 minutes being a typical time. Chai and other teas combined with fragrant herbs and spices may require additional infusion time to allow the full flavor to develop. Common Black Teas are Darjeeling tea and Assam tea from Northern India. Puerh Tea is the only type of tea that is truly fermented as the oxidation process is never halted during processing. These teas are often retained in storage for a minimum of 20 years before going to market. Their complex flavors robust constitution require full boiling water. Many premium grade teas can handle multiple infusions utilizing the same tea leaf. In fact, many tea subtly change flavor in subsequent infusions revealing flavors masked by stronger overtones of the tea. White and Green tea often tolerate 3-4 infusions, Yellow tea and Oolong tea tolerate 5-8 infusions, Black (Red) tea tolerates 3-5 infusions, and a good Puerh can sometimes last a dozen infusions or more. A good 'rule-of-thumb' to follow is to add 30 seconds to the first infusion time for each subsequent infusion. Rooibos (Aspalathus linearis, often referred to as red tea but is different from a true red tea) and honeybush (Cyclopia spp.) are not true teas (i.e., they are not made from the Camellia sinensis plant), but are derived from African plants and are infused in a manner similar to tea. These are herbal 'teas' often referred to as tisanes. Read the instructions that came with the product. If no instructions came with it, infuse as you would black tea, and experiment with infusion times and water temperatures in future attempts until you find the flavor that most appeals to you. Yerba maté (Ilex paraguariensis) is a South American holly plant. Maté is a tea-like infusion that can be prepared in the same manner as green tea. However, there are many other methods that produce a very different (and some would say better) flavor. Detailed maté preparation is beyond the scope of this recipe. Here's a traditionalist view on how to make it, which shares much with George Orwell's essay, "A Nice Cup of Tea". Use freshly drawn water and bring it to a boil in a kettle. Meanwhile, prepare your teapot. A stainless steel pot may be used, but earthenware is preferred. The pot should be warmed: add some hot water and let the warmth pervade the pot. Drain off the hot water, then add the tea. Remember to take the pot to the water, never the water to the pot. Whatever tea you use (and for proper emotional rescue you should use a strong Indian or Kenyan-based blend), do not use teabags. You need to let the tea leaves swim free and with teabags there will inevitably be a papery tinge to the taste. This rule is, however, widely broken. Measure tea according to the size of the teapot and the strength of tea you prefer. 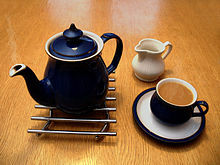 In a large teapot (serving four cups), two teaspoons will give a fairly weak tea, perhaps enough to console one for a lost umbrella on a rainy day, and four should be strong enough for being stood up on a Friday night. A broken heart may need six. Add the water as soon as it boils, and leave it to stand for five minutes (and no longer) before serving. Use a mug if you must, but a cup with a saucer is far more civilised. Traditionally you should add full-cream milk, but semi-skimmed will do. If you are familiar with the strength of tea you make and the size of the cups, you can follow the 'milk in first' technique. Otherwise, add milk to the tea, to ensure you get the right colour. Add sugar according to taste and the extent of the emotional crisis you are trying to overcome. Serve with a biscuit or two, and prepare to feel much better. This page was last edited on 21 June 2018, at 17:17.